Low standing, heads held high! After their first soccer game was canceled due to a thunderstorm, the lady Saints travelled to California. In their opener against Cal State University – Los Angeles, the Saints lost 0-4. CSU-LA jumped to a 1-0 lead after 34 minutes of the game before scoring their next three goals between minutes 54 and 61 to close out the game. The Saints had seven shots with only one on target, while CSU-LA had 15 shots with seven on target. They continued their road trip in California by trouncing Holy Names University, 4-0. Nikki Roberts started the Saints’ scoring rampage by scoring in minute 37. Kelli Bannerman quickly followed up Roberts’ goal by scoring in minute 39. Bannerman scored again in minute 50 with assists from Randi Mielke and Ashley Richardson. 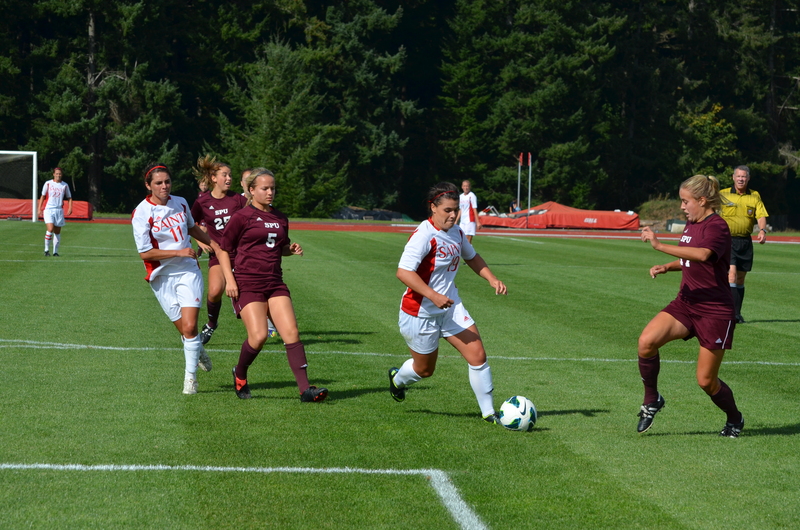 Bannerman then completed the second hat trick in Saint Martin’s women’s soccer history by scoring in minute 72. The lady Saints’ defense allowed only five shots (two on target) from Holy Names; Hannah Barlow blocked the first shot on target and Gina Cardenas blocked the second. The Saints’ offense improved from their game against CSU-LA by shooting 14 shots (eight on target). The next game against Dominican University of California was a rough one for the Saints, who lost 0-2. Cardenas spent the entire 90 minutes in goal for the Saints, recording 10 saves on 12 shots, letting just two goals in. The Penguins shot 14 shots (12 on target) while the lady Saints shot just seven (four on target). Bannerman earned GNAC / Red Lion Offensive Player of the Week for scoring her hat trick against Holy Names. The Saints will be playing Simon Fraser University next in Burnaby, British Columbia, on Sep. 26.